Next Wednesday Dracula at the Prince of Wales Theatre also reaches its 250th performance. There was a surprise awaiting those who attended the 250th performance of “Dracula” at the Prince of Wales. 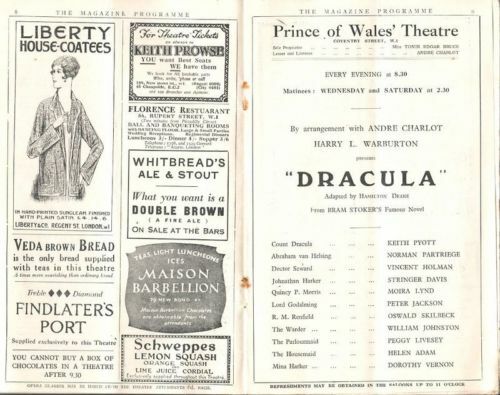 To each patron of Bram Stoker’s creepy play was handed a little parcel containing a souvenir of the occasion. 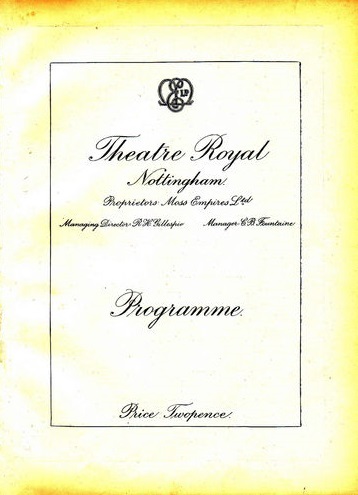 A printed slip exhorted you not to open the parcel until after the conclusion of the third act of the play. When at last the time limit had expired, and the “creepiness” of “Dracula” had entered well into the spine and marrow of every playgoer present, the parcels were opened. Then everybody seemed to do the same thing. Fair ladies took hysterics, strong men swore beneath their breath. For out of each book of short stories there fluttered viciously a great toy vampire bat with black wings and red eyes.